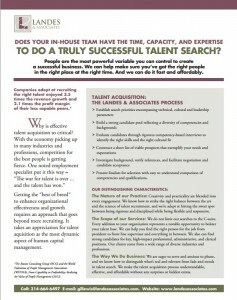 DOES YOUR IN-HOUSE TEAM HAVE THE TIME, CAPACITY, AND EXPERTISE TO DO A TRULY SUCCESSFUL TALENT SEARCH? Download more information about our Talent Acquisition Services. To learn more about how our experts can help you attract and retain top talent, contact Gil Lewis at 314-482-9478 or send Gil and e-mail.